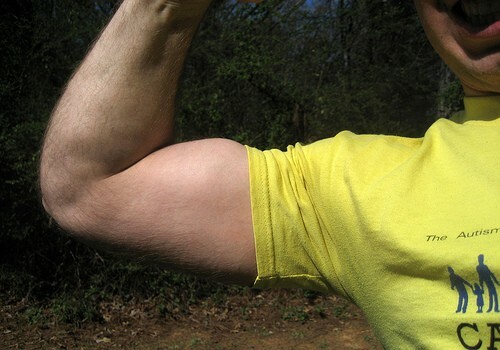 The biceps are found on the front of the upper are and are very commonly seen as the key to being strong. There are two heads (tendons) at the top of the bicep which originate at the shoulder where they attach to the scapula. The muscle belly lays flat on the front of the upper arm and ends in two heads at the bottom which attach to the forearm bones, radius and ulna. The biceps cross both the shoulder and elbow joint but their primary focus is movement at the elbow, but they do support shoulder movements such as a shoulder press. 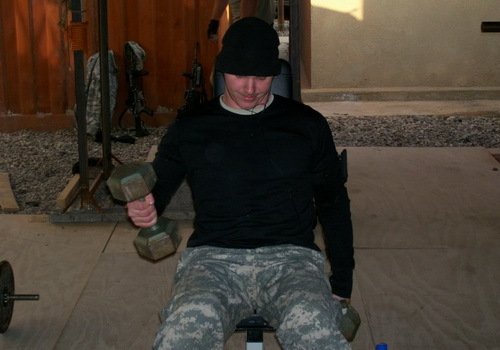 Dumbbell curls are the traditional exercise to improve bicep strength. 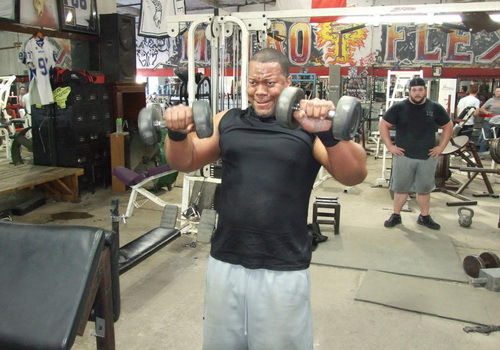 For the starting position stand with feet shoulder width apart and the dumbbells in both hands resting at arms length, make sure your elbows are tight into the body and your palms face forward. To begin the exercise slowly curl both your elbows lifting the weight until it reaches your shoulder level, hold and then slowly lower back to the starting position. Remember you need to exhale as you lift the weight and inhale while lowering. Repeat this process for the amount of repetitions required. To vary this exercise you can complete them sitting on a bench with back support or even on a chair in your own home. This exercise requires the use of a barbell rather than dumbbells. You should stand with feet shoulder width apart with the barbell resting at arms length with a shoulder width grip on the bar, your palms should be facing forwards and the elbows tight into your waist. Exhale and curl the barbell forward bending your elbows until the bar is at shoulder height and the biceps are fully contracted, make sure only the forearm is moving and you are not bending your back to pull the bar. Hold the bar for a second and then whilst inhaling slowly lower back to the starting position. To change the difficulty of this exercise you can widen or narrow the grip, or you can also use a straight bar on a cable pulley machine rather than a barbell. This is a slightly harder exercise to do but with practise can fit right into your upper body workout. Using a straight bar on a low pulley lie down either on the floor in front of the pulley or on a flat bench with your legs straight, grab hold of the bar so that it rests at arms length, it may be advisable to have a spotter to pass you the bar. Exhale and slowly curl the bar towards your shoulders keeping your upper arms still until the bar is at shoulder level, hold and then return to the start position while inhaling. Remember to try and maintain the speed of the movement both up and down to keep the bicep under tension, and repeat as many times as needed. To vary this you can have the palms facing towards or away from the body or change to an EZ bar. Using an EZ bar gives variation to training the bicep and avoids boredom when working out but it also makes the biceps work in a slightly different way to maximise results. To start stand with feet shoulder width apart and the EZ bar resting at arms length, you should hold the bar at the wider grip and the palms will be facing forward and slightly inwards due to the way you grip the bar. Exhale and slowly curl the bar towards your shoulders moving just the forearm until the bar reaches shoulder level. Hold for a second and then while inhaling lower the bar to the starting position. Repeat for the required amount of reps. To make this movement harder you can move the grip to the narrow position which increases the intensity of the exercise. 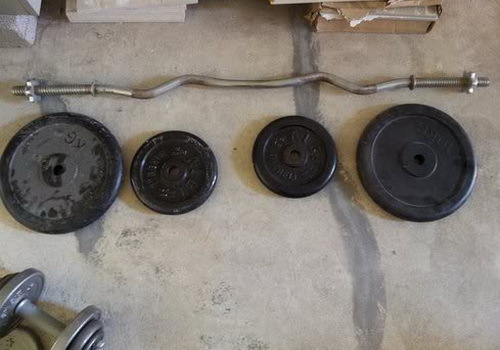 To perform this movement you need a scott bench and an EZ bar. To begin sit at the Scott bench with upper arms resting on the pad but make sure your elbows are supported and not hanging over the edge, also your chest should be resting against the bench. Hold the EZ bar at the inner narrow grip with palms facing upwards and rest your arms in a straight position. Exhale and curl the bar towards your shoulders until at shoulder level and biceps contracted. Hold for a moment and then inhale while straightening the arms back to the start position. Again repeat this for the number of reps required and to vary the exercise you can widen the grip on the EZ bar. Resistance bands are a great alternative to traditional dumbbells and barbells. One resistance band can provide a range of exercises and they come in a variety of tensions to make the exercises harder or easier. Some simple ways to use bands for the biceps are to complete standing curls, stand on the centre of the band with feet shoulder width apart and the arms fully straight, then curl the arms at the elbow to shoulder height and lower. You can also wrap the band around a stationery upright in the gym or at home and hold the handles so the band is straight and at shoulder height with arms outstretched, while exhaling curl the forearms towards the shoulders until the elbow is fully bent and then inhale while straightening the arm. There are many more variations and using this equipment allows you to workout anywhere! To complete a Zottman curl start with your feet shoulder width apart with the dumbbells resting at arms length and the palms facing towards the body. To begin exhale and slowly curl the weights towards your shoulders moving just your forearm, but as you lift turn the palms towards the body so when your elbow is totally bent your palms are facing your body. Hold for a second, before you lower turn your palms to face away from the body and begin to lower slowly, as you lower turn the palms back to the starting position ready to complete the action again. Remember to inhale on the lower phase and exhale on the raising phase, repeat for the required amount of repetitions. 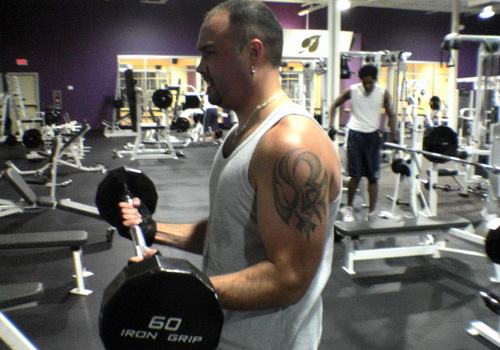 The starting position for a hammer curl is with feet shoulder width apart standing upright with a dumbbell in each hand resting at arms length and palms facing towards the body. 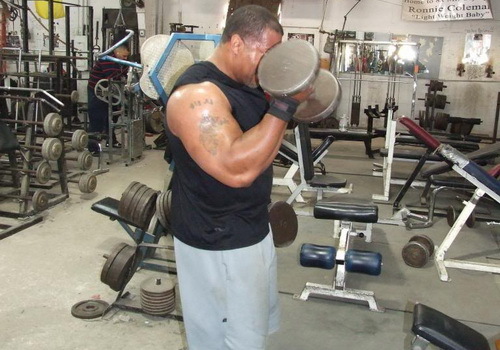 To begin, exhale while slowly curling the weights at the elbow forwards and towards your shoulder, keep going until the bicep is fully contracted and the weight is inline with the shoulder. Hold for a second and slowly lower, whilst inhaling, back to the starting position. 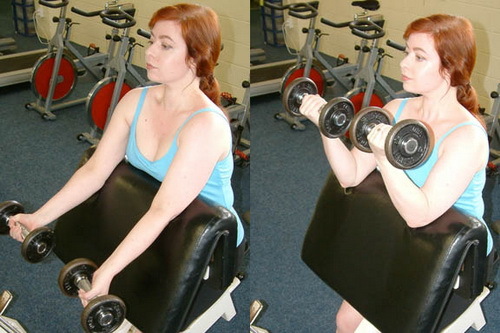 This can be repeated for the required amount of repetitions and it can be completed by lifting both weights in unison or alternating each arm, similarly it can be completed while sitting down on a bench. 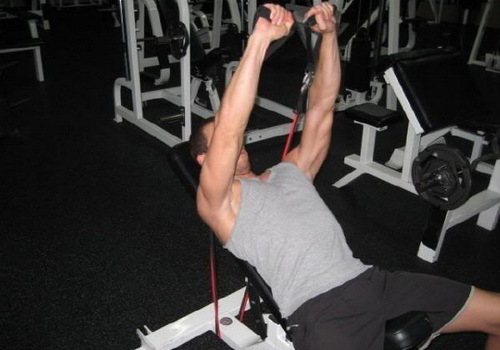 Using a cable pulley machine is an excellent variation to training, it increases the tension the bicep is under on both the upwards and downwards phases giving maximum results. Use a straight bar attached to a pulley set at the low position, stand with feet shoulder width apart and hold the bar with both hands at arms length with your palms facing away and towards the pulley. Exhale while curling the bar forwards and towards the shoulder moving only the forearm until the bar is at shoulder length, hold and then inhale while slowly lowering to the start position. Repeat as many times as required and to vary this exercise you can use single arm levers and alternate or change the width of your grip on the bar. A muscle pull on the eye area, need great assistance. 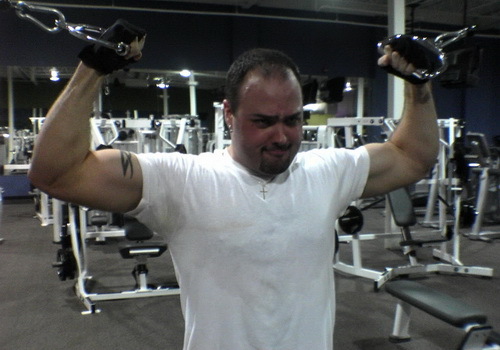 What is the best exercise to make my shoulders wider and bigger?